Leaves with huanglongbing symptoms. Note the yellow areas to one side of the midveins and the dark green areas directly opposite. Source: California Agriculture journal, October - December 2012, Volume 66, Issue 4. Regardless of where you live in California, it is time to get familiar with the Asian Citrus Psyllid (ACP). Since first being found in California in 2008, the Asian citrus psyllid has been spreading throughout California and there are now county-wide quarantines in place in Imperial, Los Angeles, Orange, Riverside, San Bernardino, San Diego, Santa Barbara, Tulare and Ventura Counties, with portions of Alameda, Fresno, Kern, Madera, Merced, San Benito, San Joaquin, San Luis Obispo, Santa Clara, and Stanislaus counties also under quarantine. 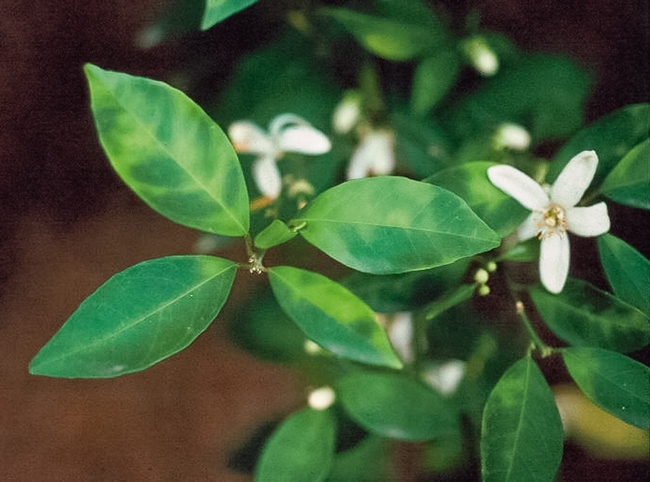 ACP can carry the disease huanglongbing (HLB), also known as citrus greening which currently has no cure and is fatal for citrus trees. UC Master Gardener volunteers are providing ongoing outreach and education of the public concerning ACP and HLB. This activity is crucial to saving our citrus and must be expanded throughout the state. 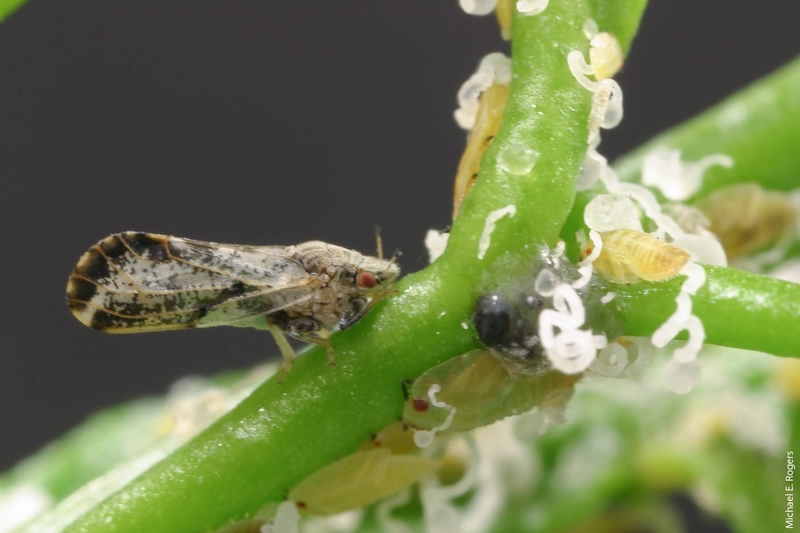 Improve your knowledge of citrus integrated pest management (IPM) and what you can do to help save our citrus through the various training materials, websites and an online course developed by UC Agriculture and Natural Resources experts. Take the online course for continuing education today. This self-directed course familiarizes users with the biology and management of ACP and HLB. At the end of the course, a certificate is provided showing evidence of successful course completion. If asked for a password and login simply enter as a "guest" located under login at the bottom of the screen. This training is available to the public and no login is required. Asian citrus psyllid (ACP) adult and nymphs. Source: California Agriculture journal, October - December 2014, Volume 68 number 4. It is estimated that 60% of Californians have at least one citrus tree in their yard so HLB could have a devastating effect not only on California agriculture but also on the California residential landscape. Be part of the prevention effort by staying educated and alert to our local citrus. Save our citrus! As many of you know, I retired at the end of June. 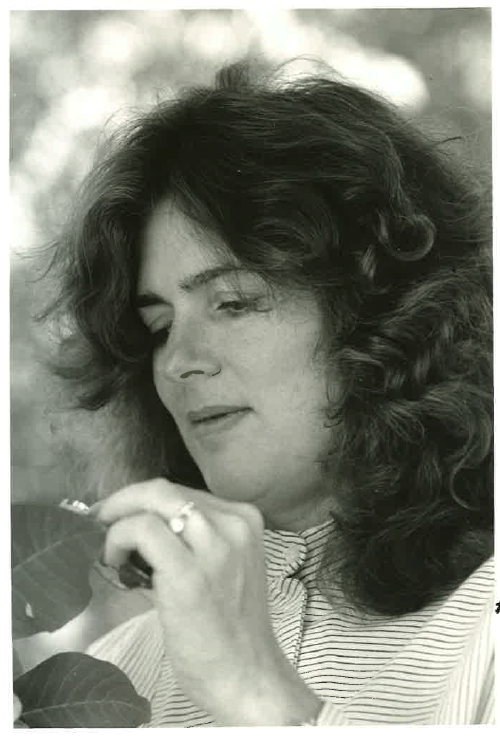 During my 34 years with the University of California division of Agriculture and Natural Resources (UC ANR), many of my most rewarding moments have been spent with Master Gardeners. I am constantly amazed by the enthusiasm, energy, creativity and knowledge of Master Gardeners. What an incredible service they provide for UC and the California public! I was hired to create Integrated Pest Management (IPM) programs for agriculture, but my interest in Master Gardeners started early. I remember attending the California State Fair in the early 1980's and being somewhat horrified to find the UC Master Gardeners answering questions using the Ortho Problem Solver and the Rodale Guide to Organic Gardening. I was told that they relied on these books because UC provided very little garden pest management information. This motivated me to write Pests of the Garden and Small Farm and later to hire Steve Dreistadt to compile Pests of Landscape Trees and Shrubs. From there we moved on to the Pest Notes, Quick Tips, UC IPM web site, UC IPM kiosk, our YouTube channel, blog and Twitter. Master Gardeners embraced and promoted all these products and now UCIPM is as well known for its home and garden information as for agricultural IPM. I have loved teaching Master Gardener volunteers. They are the most enthusiastic students ever. I learn something every single time I go out and teach a class—and I've taught thousands of them. UC Master Gardeners inspire so much of what we do. beetle releases for aphid control. All the published literature said releases weren't useful, but Master Gardeners challenged this idea. Over a 3-year study, Steve Dreistadt and I found that they were right, and we published several journal articles documenting the results. Last but not least, thank you to all of you Master Gardener Coordinators. Each of you does an incredible job gently guiding and informing your enthusiastic volunteers. I have watched you in action and you do something special every day. Annual reappointment is a requirement for all volunteers working with UC Agriculture and Natural Resources. Please read this update thoroughly and direct any questions regarding the appointment process to your program's Master Gardener / Master Food Preserver Coordinator, Advisor or County Director. Reappointment starts May 12, the process for reappointment can be done in three easy steps! Note: First year Master Gardeners / Master Food Preservers are required to complete a minimum of 50 volunteer hours (no continuing education requirement) before the next certification cycle. 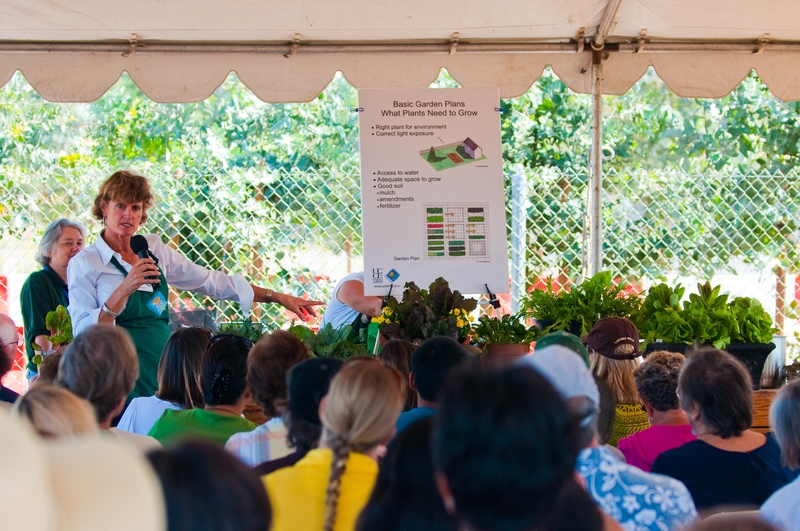 University of California Cooperative Extension (UCCE) Master Gardeners have been at the forefront of promoting sustainable landscape practices. 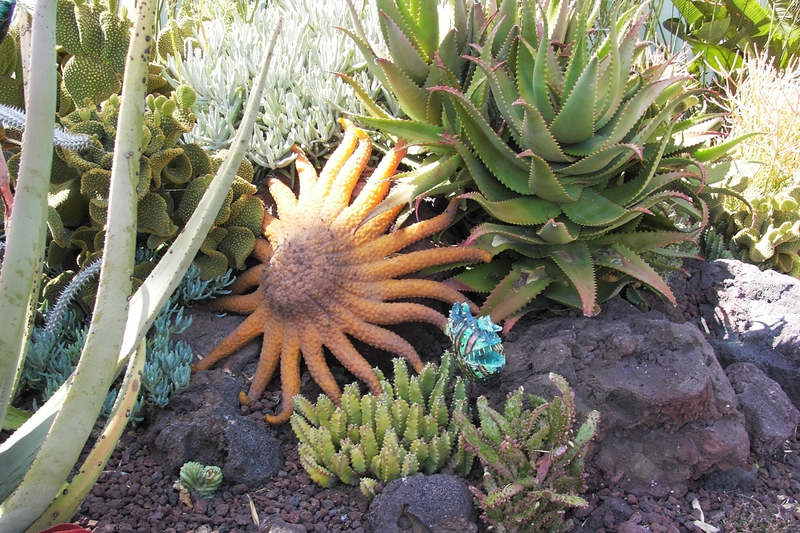 UCCE Master Gardeners now have a new free powerful publication at their disposal, “Sustainable Landscaping in California: How to Conserve Resources and Beautify your Home Landscape” (ANR Publication 8504). This in-depth publication provides research based information for individuals interested in adopting sustainable landscape practices. 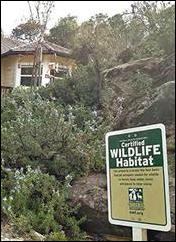 These practices include: plant selection, water conservation, pest management and providing wildlife habitats. The free publication contains helpful figures, photos, and references for individuals looking for detailed and more complex information. “Sustainable Landscaping in California” can be a powerful tool for new volunteers working at a helpdesk or for developing workshop content or use in a presentation. The sustainable landscaping publication is available as a free downloadable Adobe PDF from the UC Agriculture and Natural Resources (ANR) Catalog. Don't forget to check-out some of the other high-quality gardening publications available. Ask a local UCCE office about publication discounts for volunteers! UC Master Gardeners Search for Excellence Awards Accepting Applications! As University of California Cooperative Extension (UCCE) Master Gardeners, we are all doing great things. Search for Excellence (SFE) awards is an opportunity to celebrate and share accomplishment by showcasing the tremendous talents of Master Gardeners statewide. Master Gardeners are invited to submit an educational and innovative county project for consideration April 1 – July 1, 2014. What is the “Search for Excellence”? Master Gardeners have successfully developed outreach projects in their local communities and have dedicated an huge amount of time and resources to ensure the project's success. The Search for Excellence awards are a small way to recognize and thank Master Gardeners for all that they do. Search for Excellence is a statewide competition which recognizes county UCCE Master Gardener Programs for outstanding projects that support the mission of the UC Master Gardener Program. What Projects Count for SFE Award Considerations? Search for Excellence awards are designed to highlight the statewide conferences and we hope you will consider submitting an application for a project in your county that educates the public in a special, fun and creative way. Additional details including guidelines and an application for the 2014 SFE awards are attached below and also available on the 2014 UC Master Garden Conference website. If you think one of the projects is a candidate for an award based on its' development, implementation and impact in the community, let your Master Gardener Program Coordinator or leader know about it!